ZOE LEONARD IS AN AMERICAN, NEW YORK-BASED ARTIST WHO WORKS WITH PHOTOGRAPHY, SCULPTURE, INSTALLATION AND FILM. SINCE HER INCLUSION IN DOCUMENTA IX IN 1992 SHE HAS HAD A MAJOR INTERNATIONAL SOLO CAREER, EXHIBITING WIDELY IN THE US AND EUROPE. SOLO EXHIBITIONS INCLUDE SHOWS AT THE CENTRE NATIONAL DE LA PHOTOGRAPHIE, PARIS (1998), PHILADELPHIA MUSEUM OF ART (1998), AND BASEL KUNSTHALLE, SWITZERLAND (1997). HER WORK HAS BEEN FEATURED IN GROUP EXHIBITIONS AT THE WHITNEY MUSEUM OF AMERICAN ART, NEW YORK; MUSÉE D’ART MODERNE DE LA VILLE DE PARIS, PARIS; AND THE MUSEUM OF MODERN ART, NEW YORK. SHE IS A 2006 RECIPIENT OF A GRANT FROM THE ANONYMOUS WAS A WOMAN FOUNDATION. SHE IS REPRESENTED BY TRACY WILLIAMS LTD. IN NEW YORK CITY. 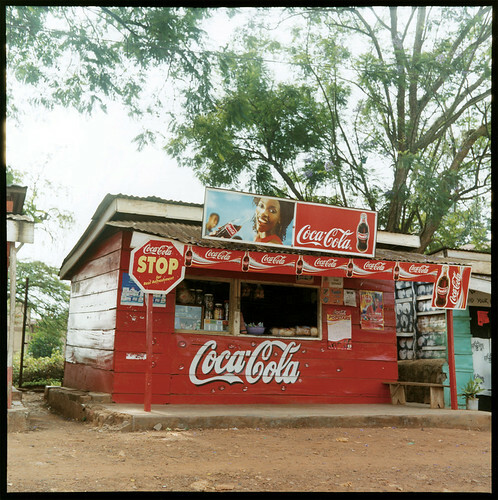 The four photographs reproduced here were taken in Kampala, Uganda in 2004. They are part of a larger ongoing work, Analogue, which Leonard has been working on since 1998. Comprised of over 300 photographs, this body of images documents the disappearance of small locally-owned shops in the face of a continuously expanding network of multinational chains and franchises, and explores the ways in which we are connected through our global economy. Taken with a traditional Rolleiflex camera, Leonard’s photographs of storefront displays, handwritten signs, and homemade arrangements of goods, serve as a documentation of urban life at the end of the twentieth century. Analogue premiered in 2007 at the Wexner Center for the Arts in Columbus, Ohio. The exhibition traveled to Documenta 12, Kassel, Germany; Villa Arson, Nice, France; the Dia Foundation and the Hispanic Society, New York; and the Reina Sofia, Madrid, Spain. The project has been made possible through the support of the Wexner Center for the Arts, Creative Capital Foundation, the Pollock-Krasner Foundation and the Bellagio Center.